Thursday is always a good day. Must be the memories of college days when Thursday was the end of the week – regardless of the classes, tests, or obligations still to come on Friday. 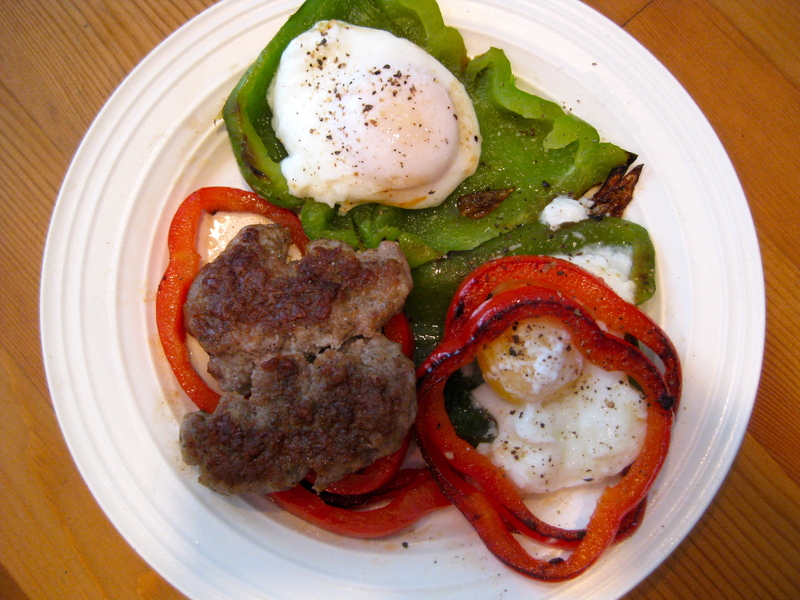 Breakfast: Poached eggs and sausage (all from Cherry Grove Farm) over broiler-roasted peppers. Broiling is a quick way to soften and blacken peppers for that delicious roasted flavor. A great trick when poaching eggs at home is to pour the cracked eggs into mason jar rings. 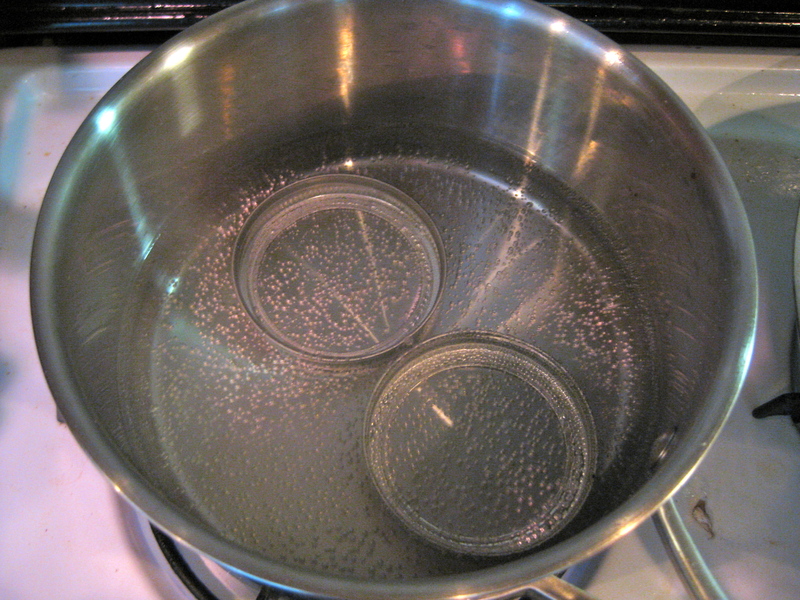 Bring the water to an almost-boil, add eggs, then turn off the heat, cover, and leave eggs for about 5 minutes. 5 minutes under the broiler should also be perfect for the peppers. Apparently you're not “supposed” to broil/roast green peppers due to their bitter flavor – I like them just fine. This beautiful breakfast took about 15 minutes to prepare. 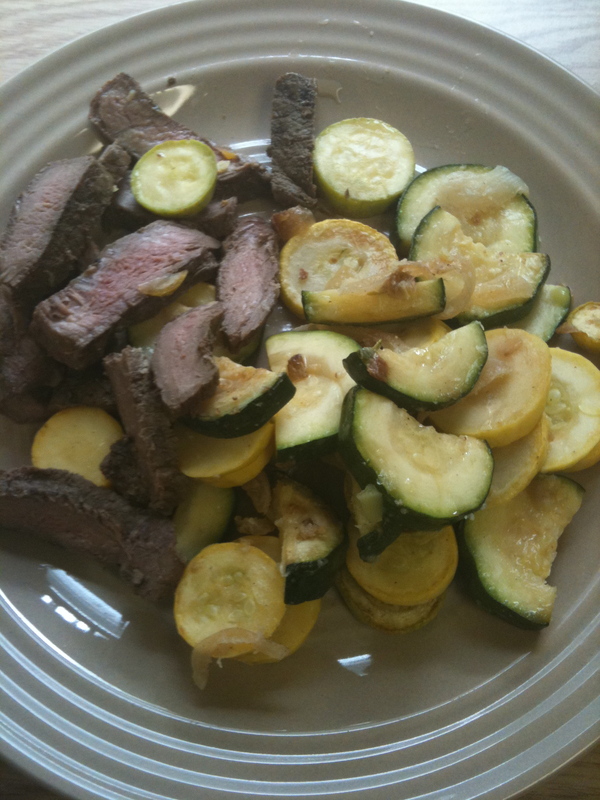 Lunch: Another helping of bison steak & veggies – this time I cooked the veggies in Ghee! Absolutely delicious. I love the texture and taste of zucchini squash. Dinner: I was in a hurry today so just grabbed the last of the fish patties from Tuesday along with some veggies drizzled in EVOO and a delicious Jersey peach. Today's Workout: This was both an emotional and a physical tear-down. I am rarely violently forced out of my comfort zone – I prefer to do what I already know I can do and go home exhausted but proud. This workout, however, broke me down completely – and then built up my resolve, my determination, and all-in-all left me better than it found me. I needed this workout to push me over the edge, from doing what I “know” I can do towards doing what I WANT to be able to accomplish. I was hurting. My wrists were checking out. I couldn't hold the bar up at the Rxd weight for more than a few overhead squats, and was tasked with performing 3 sets of 21-15-9 reps coupled with pull-ups. 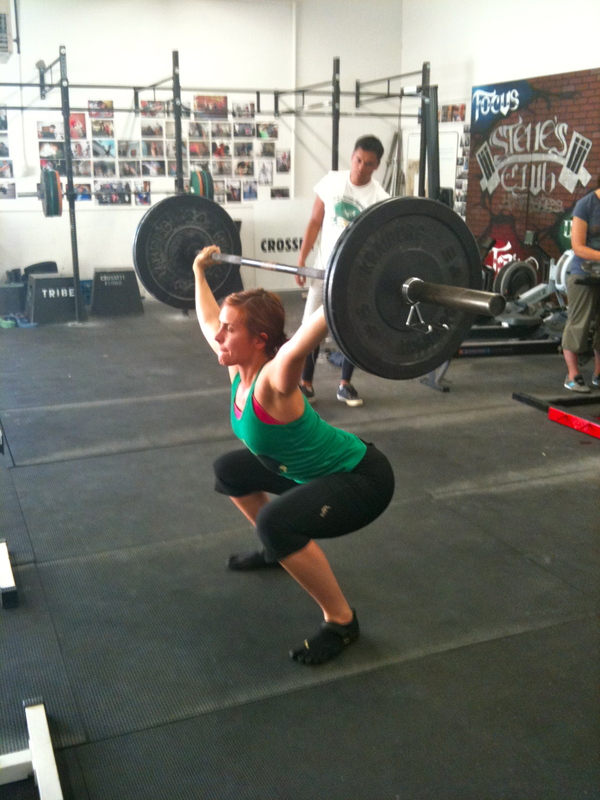 A few times I got the bar up only to drop it again. I was the last to finish by a good 7 minutes, so all the focus and expectations of my Crossfit people were on me. I wanted to cry. I wanted to punch my husband in the face for cheering me on. I wanted to disappear. Then I finished. And I realized that I am the luckiest person in the world to have such a supportive crew – from my wonderful husband who LOVES a strong, determined woman to the amazing Crossfitters I am privileged to call training buddies. I needed this push. *To re-iterate the purpose of this 30-day documentation, my mission is to display the “how,” since I so often talk about the “why.” It's my hope that Paleo newbies and devotees alike will glean some ideas for their individual journeys. Ack, that website you gave me! “I didn’t realize veggies had so much protein!” Then a list that says 1 CUP of celery= 1 GRAM of protein. Dear God. That’ll get expensive. Have you ever gone to the Collingswood farmer’s market? It has a big selection, and there is a farm there that sells eggs & grass fed meat. Also thanks for the tip on broiling red peppers, I did it and it was quick, easy and delicious! We are planning on going this weekend! I don’t know how we have gone so long without checking it out. Will we see you there? Possibly! We’ve gone to that one the most. Hugh is leaving on Tuesday for his next dreaded deployment, so I may go up to north Jersey to my parents house on Friday for the weekend. It depends on how hard my week goes with 2 kids by myself 🙂 I would prefer to stay down here so I could go to the market to get my weeks’ worth of food then go up to north Jerz after that on Sat. Eek. The dreaded deployment. I am getting to know it better, unfortunately. You are such a great mom. Let me know if you ever need to give me a farm market list and I’ll pick up your groceries for you and deliver them!